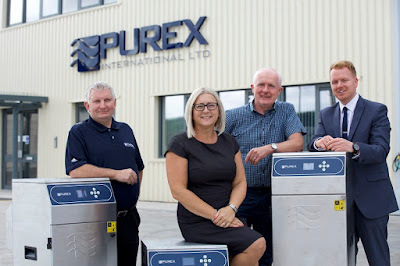 Purex International, a manufacturer of fume extraction systems, has expanded with the support of business loan from Finance Yorkshire. Rothbiz featured the move earlier this year, when the £8m turnover firm expanded from its Manvers base and relocated to Thorne Park in Doncaster. 50% of Purex International products are sold to overseas customers. It also has a network of distributors across Europe. Moving into a 18,680 sq ft unit, which it acquired on a freehold basis for an undisclosed sum, Purex said that the new purpose built headquarters will allow it to fulfil its current rapidly growing business and ambitious future expansion plans. The business was introduced to Finance Yorkshire by Barclays, which provided a commercial mortgage, and the regional funding body provided a business loan to support the move. The relocation follows a management buyout in 2015, supported by Barclays, which saw Trefor Jones and Andy Easey acquire the company from Domino Printing Sciences. Trefor Jones, managing director at Purex International (pictured, far left), said: "We were in rented accommodation but wanted to purchase our own building. This move gives us more stability for the longer term. "Last year we opened a subsidiary in the US where we have been trading for many years . We have a good reputation in the market for the quality of our products and now we are able to offer an enhanced, local service. The US market is worth $220m so there is potential for growth." Melanie Reynolds, portfolio executive at Finance Yorkshire (pictured, second left), added: "There is an exciting future ahead for Purex International as it looks to build on an already strong reputation for quality and service by building its US sales, developing new markets and investing in new products."